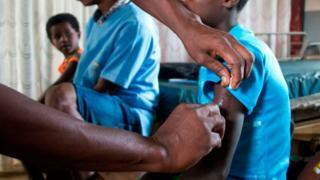 Number of pipo wey get measles for world don increase times three for di first three months of 2019 if you compare am to dis time last year, according to World Health Organisation. WHO say di informate wey dem get show say for evri part of di world measles dey come back and infection for Africa don rise reach 700%. FGM: Wetin e be, wia & why e dey happun? As na only one pesin out of ten pipo wey get am dey report di case for world, demsay di true number of case dey high. Measles na very infectious disease wey fit catch odas quickly and e fit cause serious health complications including infection for lungs and brain. Inside 2019 alone, 170 kontris don report 112,163 case of measles compare to 163 kontris wey bin get 28,124 case. Two tins dey make measles international palava according to BBC health and science tori pesin James Gallagher. Di first na poverty and di second na misinformation. For poor kontris na only few pipo dey take measles immunisation as most of di oda pipo dey like dat witout protection. Witout protection e dey easy for pipo to get infection - na so e dey happun for Democratic Republic of Congo, Madagascar and Kyrgyzstan. But di tin be say even rich kontris wey suppose dey do immunisation well well also get more pipo wey measles dey worry. Di reason na sake of pipo no wan give dia pikin dem di vaccination again becos of fake messages wey full for social media. Female Genital Mutilation: Wia e dey happun and why?